Currently, one in nine people across the world lack access to safe water, and an estimated 842 000 people die every year from a water-related disease. It's not just about health and hygiene – all aspects of social and economic development – referred to as the food–energy–health–environment 'nexus' – depend on water. 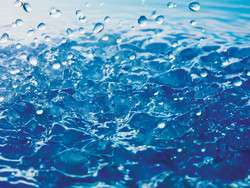 And demand is set to soar in the future as a combination of growing populations, increasing demands for resources associated with improved standards of living, and other forces drive pressure on water resources. Climate change is also creating new uncertainties with regard to freshwater supplies and to the main water use sectors such as agriculture and energy. However, some countries don't have to wait for the future to witness a full-blown water crisis. In Pakistan, the situation is already dire in some areas with a new study revealing that 80 % of water resources in the country's southern Tharparkar district are unfit for people to drink. Barely 5 % of the population has access to clean and disease-free potable water, according to a study by Dow University of Health Sciences (DUHS) and the Pakistan Council for Scientific and Industrial Research (PCSIR) reported by Reuters. Tharparkar depends heavily on rain-fed ground water, as it has no rivers. It receives an average annual rainfall between 200 and 300 millimetres, 80% of it during summer monsoon season, which runs from July to September. The rainfall recharges groundwater that must then last for the other three quarters of the year. Since 2011, Reuters reports, average annual rainfall each year has been less than 50 % of normal, straining further already depleting groundwater resources, according to the Pakistan Meteorological Department. One of the results of this has been worsening fluoride contamination of underground water sources as less water recharges the drying system. The DUHS and PCSIR study found that the fluoride level at many locations in Tharparkar is at dangerous levels of over 13 mg/litre compared to the 1 mg/litre considered normal. As Reuters reports, excessive fluoride intake, from sources with more than 1.5 mg/litre of fluoride in the water, can cause problems such as bone deformation, dental problems, and damage to the kidneys and thyroid. One solution, as reported by IRIN News, is to use indigenous water-purification technologies. The NGO Thardeep Rural Development Programme (TRDP) has reached around 1 000 villages with water solutions, often using water access and purification methods based on traditional practices. One such purification technique is 'mussafa', which involves using a 1kg-bag of graded sand, treated with silver, as a filter in the clay pots used to store water. However, the scale of the crisis in Tharparkar has now led to the provincial government stepping in and investing over EUR 46 million in installing 750 solar-powered reverse osmosis water purification plants. According to Reuters, all of the facilities are expected to be set up and working by June this year to help get safe drinking water to the region's over 1.5 million people. Billed as the 'Asia's largest (by capacity) solar-powered water purification plant', the facility will treat enough water to meet the needs of 300,000 people in Mithi and in 80 adjoining villages. The situation may be extreme in Pakistan but Europe is not immune to water shortages. According to the European Environment Agency (EEA), eight European countries can be considered water-stressed: Cyprus, Bulgaria, Belgium, Spain, Malta, Italy, UK, and Germany. And in the future it is likely that predicted climate change will exacerbate this situation in the most water scarce parts of southern Europe. Finally someone grew a brain, instead of praying for rain.